The Virginia Department of Transportation [VDOT] has announced the closure of Catharpin Road in Gainesville between the northern Executive Drive intersection and Route 234 (Sudley Road). 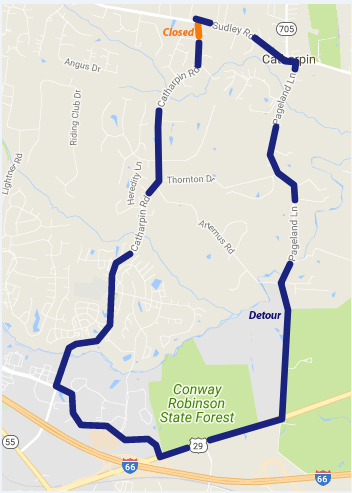 Catharpin Road will be closed to through traffic from 7 a.m. Monday, August 6 until 3:30 p.m. Thursday, August 9 for stormwater pipe replacement. According to VDOT, residents within the closure area and emergency vehicles will have access to the closed portion of Catharpin Road, but will not be able to go beyond the point of pipe replacement in either direction. Traffic will be detoured via Route 234, Pageland Lane, Route 29 and Heathcote Boulevard back to Catharpin Road (image below).